The last big project for my closet room was some artwork for the blank wall above my shoe shelves. I had a vision of what I wanted to do and even though it ended up being a lot harder than I’d planned, I couldn’t be happier with the results. 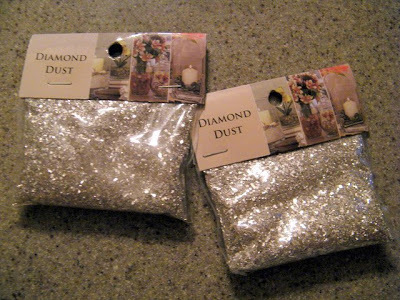 The inspiration all began when I found this Diamond Dust at the craft store a few weeks back. Strangely enough, it was in the floral arrangement aisle. It is the perfect “gilver” (gold/silver mix) and the particles are an irregular shape…almost like tiny shattered pieces of mirror. Once the tape was removed, I carefully brushed off any loose pieces of glitter that had fallen onto the white stripes. Then I sprayed the entire canvas with a coat of sealant. I love how the light from the chandelier reflects off the diamond dust and adds another element of sparkle to the space. Can’t wait to show you all part 2 of my closet reveal…coming next week!! I. LOVE. THIS! Does the sealant keep the glitter from falling off? That much glitter scares me. I feel like it could fall off for years! That. Is. FABULOUS. 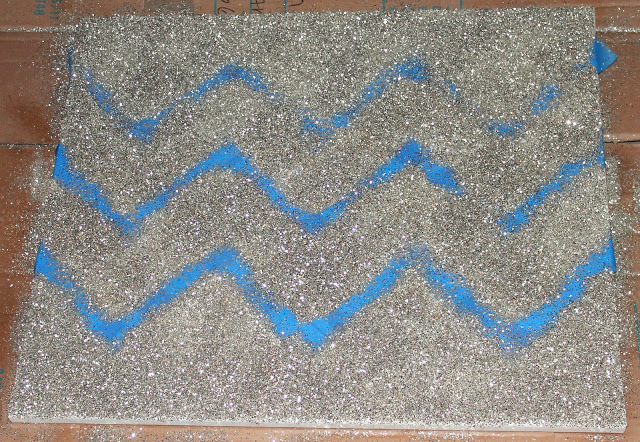 I have been meaning to do a chevron painting as well, but hadn't considered throwing some glitter into the mix. I'm totally swiping your idea. LOOOVE. Your creation looks stunning! And perfect for your closet room! Wow this is brilliant! 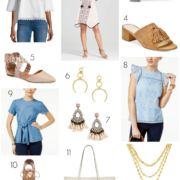 Super easy, super cheap, and super chic! I'm going to making this in the near future as well. Thanks for the idea! Wow great job, love it! what a great project – so easy and totally glam! You'll have to let us know if the glitter stays on well! this is SO fun!!! oh, how i wish i was a diy'er. i am in LOVE with your closet room!!! 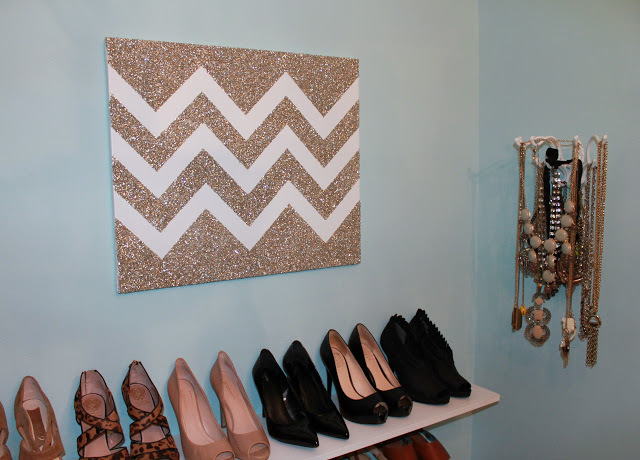 I love this and it is perfect for you wardrobe room! Love it!! Okay, now THAT is a DIY I think I can handle. =) I love the way it looks, so classy and chic. Now I just need to find a place to put it….. This is great! 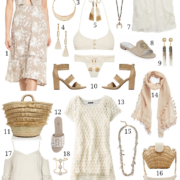 My closet is itching to have more inspiration and sparkle — this would fit the bill just right! I cannot wait to see part II of your closet reveal. SPACE!!! 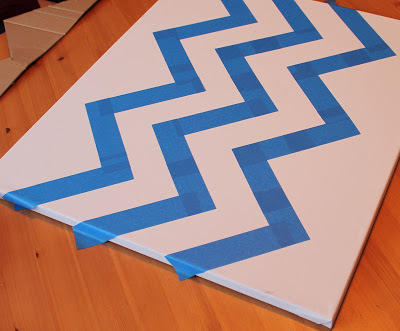 And your Chevron DIY is amazing! Seriously I didn't know your closet could get better! I LOVE THIS IDEA!!!! OMG I Love this! This is so simple yet brillant. Totally inspired right now! Great DIY! I've been meaning to this exact thing, except with paint in my living room! This looks so good! I haven't really gotten into DIYs yet, but this looks so fantastic I might have to try! 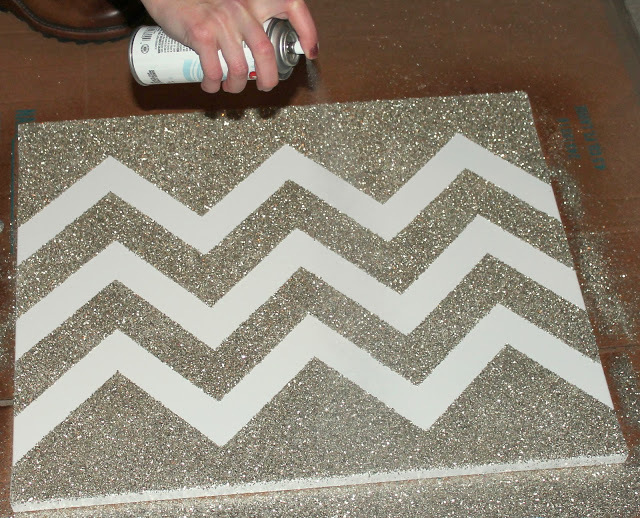 OMG…I love chevrons…and I love glitter…so this couldn't be anymore perfect…I'd love to recreate this, but I guess I need to figure out where I would put it first…but this is the coolest thing I've seen in awhile! wow this is great! very creative and looks easy too…I love your shoe shelves!!! This is so pretty! such a great creative idea! i love it! LOVE THIS IDEA. I REALLY WANT TO TRY, SUNDAY PROJECT IS IN ORDER. This looks like a fun project!!! It looks great in your closet! That's a fun art piece! It looks great on your wall! Love this DIY and that Diamond Dust is awesome! THink I will be needing it immediately! Looks amazing! 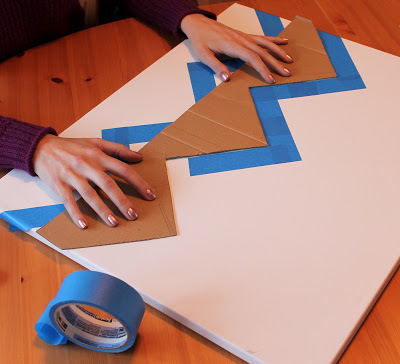 I'm totally addicted to chevron but always am intimidated by DIY projects with it because of all that measuring – your cardboard template solution was very smart! I freakin' LOVELOVELOVE this. I need to do this when I get my own place. Chevron is such a interesting design, too. It immediately pops. Great job. 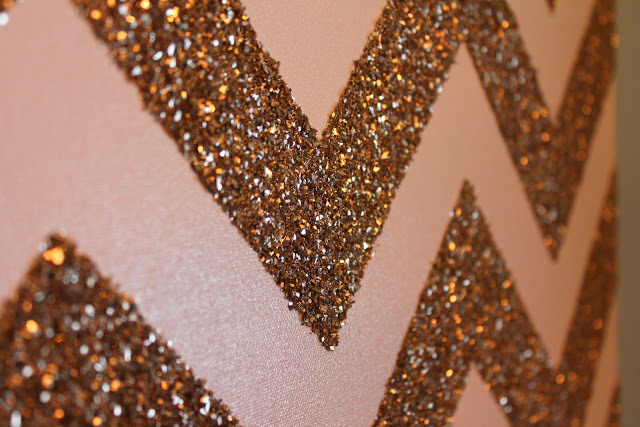 I'm obsessed with chevron- combine with glitter and I'm sold! Such a perfect piece for a girly closet…love it! Where did you buy the diamond dust/about how much was it? And is it like normal glitter or more fine? Hi there, I found it at JoAnn's Craft Store in the floral arrangement section. It is actually chunkier than regular glitter and the pieces are irregularly cut (kind-of jagged) instead of round, like glitter. Hope that helps! I looked at JoAnns online & they only had Diamond Dust in a jar & it only cam in white?? Hello Ky – I think that must be different than what I bought because this is definitely a gold/silver color! What brand of sealant did you use and where did you get it? Thank you! Wow, this looks amazing and it really is very simple. Love this! It looks so cute! Thank you for sharing!!! 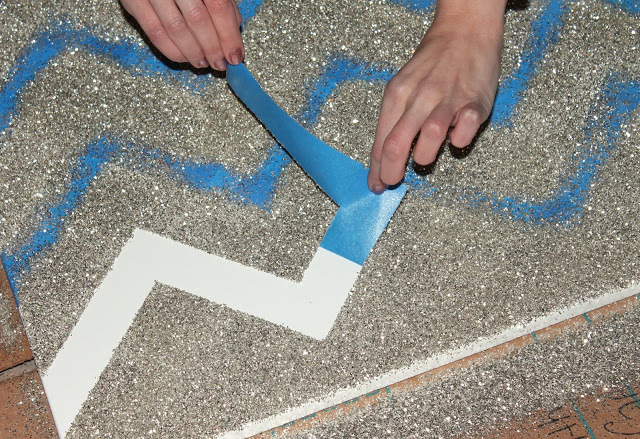 The chevron stripes were the same width as the painter’s tape. The cutout we used was based on the size of the canvas and how far away from the edge we wanted the chevron pattern to start – does that make sense? where is your necklace holder from? or, what is it? I’m so sorry – I don’t still have the cardboard we cut out to create it, but the chevron lines are 4 inches wide if that helps!